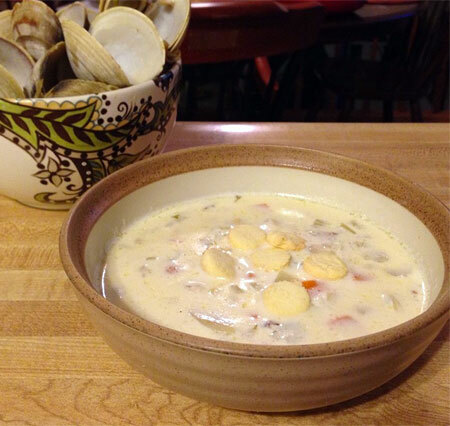 I don’t think I have eaten clam chowder since moving back to Colorado, since there aren’t that many good restaurant venues to order it from; we haven’t purchased canned chowder since we were in college and used it as sauce for linguine, eaten out of our one communal mixing bowl. But there was a good deal on littleneck clams at Whole Foods and chowder immediately sprang to mind, so I bought some on a whim and took them home. I followed a recipe on Serious Eats for Real New England Clam Chowder, and only made a few minor adjustments out of necessity: fewer clams because I hadn’t been sure how many to purchase, and the addition of a little diced sweet potato to make up for our dwindling supply of russets. The recipe is naturally gluten-free and made a flavorful soup that I really enjoyed, but Jeremy indicated that he prefers his chowder thick enough to stand up a spoon in, so I’ll have to keep experimenting with recipes. I also want to note that Nolan enjoyed some of the chowder broth tossed on penne pasta for lunch the next day, in an homage to his parents’ culinary roots, lol. According to the recipe, clam chowder requires a garnish of oyster crackers. I have never been a big fan of oyster crackers, as they always had a stale flavor and then turned to slimy blobs of mush in the soup. But at the last minute I decided to bang out a tray of homemade grain-free oyster crackers for Jeremy’s sake. The tiny batch of batter had just a few ingredients and was a cinch to mix up; it rolled out nicely with a dusting of arrowroot, and I cut out tiny circles with my apple corer (challenging its former status as a uni-tasker), baking them off for a mere 15 minutes. The resulting crackers were pale but crisp, but better yet, they stayed crisp even while bobbing around in my bowl of chowder through the entire meal! They were the perfect little accent to make dinner just that much more special, and I was tickled to find that Jeremy was far more enthusiastic about getting oyster crackers than I could have anticipated–I don’t think even he realized how much he had missed those little packets! This recipe makes two large sheet trays of oyster crackers, but can be halved relatively easily (beat the egg white slightly first to make it easier to divide in half). These crackers could also be flavored with herbs, spices, or a dry shredded cheese like Parmesan. Preheat the oven to 350F. Stir together all ingredients to form a ball of dough. Roll out on a surface well-dusted with arrowroot until dough is about 1/8″ thick, and score into little squares or punch out rounds with an apple corer. Bake about 15 minutes until firm and crisp; they won’t take on much color, so go by feel. Source: Slightly adapted from Predominantly Paleo.